KAPOLEI — It took a year, but the Kalani boys soccer team got its revenge Thursday night. Brison Kim's goal off an assist from Jason Strambu in the 52nd minute lifted No. 3 Kalani to a 1-0 win over No. 7 Mililani in the semifinals of the Oahu Interscholastic Association Division I boys soccer tournament at Kapolei's Alvin Nagasako Athletic Complex. The Falcons (11-0-1) remain undefeated and will face Eastern Division-rival Kaiser for the league championship at 7 p.m. Saturday at Kapolei. The Trojans (10-1-1) were shut out for the first time this season. The teams also met in the OIA semifinals last season, when the Trojans rallied from a one-goal deficit for a 3-2 victory over the Falcons. 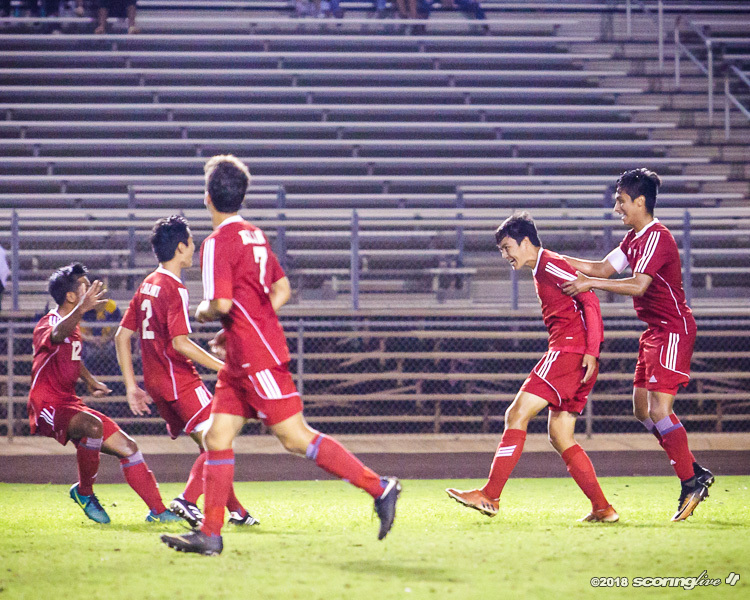 "Last year was a learning lesson that no one-goal lead is safe," Kalani co-coach Brandon Chun said. "After giving up a 2-1 lead last year, it feels good this year. The boys came through." The memory of last season's heartbreaking loss to Mililani served as motivation for Kalani Thursday night. "I mean, it just kept us going because last year we were up 2-1 and they scored two late ones on us, so we just kept reiterating on the field that we couldn't do the same thing as last year and to just push hard and finish to the end," Kim said. Although neither team managed to score in the first half, aside from the first 10 minutes or so — when the Trojans failed to capitalize on a pair of early corner kicks — the Falcons largely controlled the possession before halftime. "We came out a little antsy because we were nervous but every game helps us get better and I mean, after the first 10 minutes we kind of got the jitters out," Kim said. Chun added that it was just a matter of settling down. "I think, again, just understanding the stage of being in the semifinals and what happened last year, I think just settling down and understanding that this game wasn't going to be won in the first 10 minutes — it was going to be a battle for all 80 minutes — so I think once we settled down and started possessing the ball, we kind of got into our own game," Chun said. The Falcons broke through early in the second half. Strambu, a junior forward, drove the ball wide down the right sideline before serving a well-placed cross to Kim, a junior midfielder, who one-timed it past the Mililani goalie. "I saw Jason dribbling down the sideline and I scored a couple (goals) this season on that, so he goes down the sideline and I see his eyes look at me and I ran to the front post and I just put it away," Kim said. It was Kim's team-leading eighth goal this season and his first since Jan. 13, when he scored twice in a regular-season win over Farrington. "Brison has been our captain for the past two years, so he's our go-to guy and he came up huge," Chun said. "He put himself in a really good position to make a play and came through when we needed it most." It was just the fifth goal allowed this season by the Trojans, who saw a four-game winning streak snapped. "We made one mistake and allowed them to get down the line and get a cross in and that was really the difference in the game," Mililani coach Steven McGehee said. "We had a couple of half-chances, they had a couple of half-chances, but the game was fought in the middle of the field, I thought, and we had a hard time really winning much of that battle." Chun credited the work of fullbacks Noah Camacho, Jonathan Casey, Keoni Ichiyama and Kai Sigler. "I think our back four, I've been saying it all year, I think they're just outstanding," Chun said. "In terms of defenders that we've had come in and out of Kalani, they're four of the best that I've seen, at Kalani anyway. They did an outstanding job marking up. Mililani is heck of a team and they did an outstanding job." McGehee said the foursome made things difficult for the Trojans offensively. "They're ball-winners. Every ball we served in, we were second to them. We were never winning the ball in the air, we were always looking to hopefully get a scrap, but they did a great job and I kind of saw that with the game they played against Pearl City that that's where they were strong and we just didn't adjust very well," McGehee said. "It's always a battle playing Kalani. Give them full credit for the win and just the way they battle. We knew we were going to be in for a fight today and it happened; they showed up." The Falcons recorded nine shots on goal to the Trojans' four. Kalani goalkeeper Sena Morimoto made four saves, while Nicholas Gaston posted eight stops for Mililani. All 11 Kalani victories this season have come by shut out. The lone goal it surrendered was in a 1-1 tie at Kaiser on Jan. 17. Saturday's final will be a rematch of the 2016 OIA championship won by Kalani, 1-0.